Aside from the occasional blizzard, Buffalo doesn’t experience much in the way of traditional natural disasters like earthquakes, hurricanes, and tornadoes. However, as climate change continues to progress, Western New York could see more of an impact from mother nature. That could be anything from heat waves to water levels in the lakes rising becoming an issue for individuals living on their coast/banks. Flooding induced by changes in the level of lakes has the potential to increase. “Here, there’s an ever-growing need to look at issues of disaster management, particularly disaster preparation,” Rivera said. 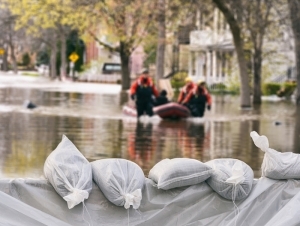 For Rivera, an expert in disaster and emergency management, looking at how municipalities prepare for serious weather events is key in determining how a disaster is handled. For example, certain towns with a plan in place may be cleared of snow during a blizzard before other areas, who didn’t prepare as well, are cleared. It’s also important to look at how first responders deal with things like a neighborhood flooding, or a building fire, Rivera said. Town administrators often aren’t trained on how to deal with disasters, Rivera said. One of the things that should be done is a “needs assessment” for municipalities to show which mayors and other local administrators need training on so that steps can be taken to better prepare these individuals to deal with emergencies. Rivera has heard stories of public officials shutting down and not responding during emergencies. Despite arguments surrounding climate change at the national level, some aspects are indisputable, Rivera said. Hurricanes, wildfires, blizzards, and tornadoes are increasing every year, and the severity is getting worse. “No matter where you are, disasters happen,” he said.